The minority when it comes to the illness speaks out. The way Webster's Dictionary describes depression is that it is "a serious medical condition in which a person feels very sad, hopeless, and unimportant and often is unable to live in a normal way." So you would probably brush it aside as someone who is just down all the time, right? That's not even half of it, but don't sweat it, you aren't the only one who may look at it like that. Many people may even have the illness and only half of those suffering aren't even aware of it! Here are a few scary statistics: 18 percent of Americans suffer from depression, 30 percent of college students suffer from depression, and 15 percent of those depressed take their own lives. 90 percent of suicides in high-income countries are caused by depression. 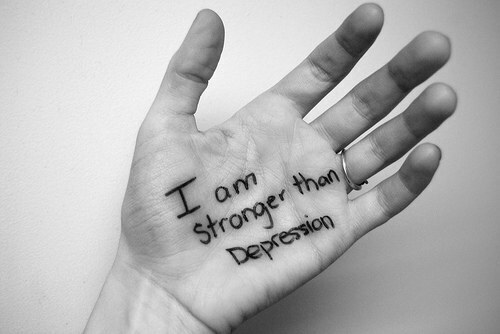 Nevertheless, depression is the most common disorder in the world, but what is it actually? Depression has many forms, but generally the same lineup of traits are found. Women tend to be more lethargic, sad, and down, whereas men are more irritable and aggressive, also tending to drown their depression with alcohol. And for every one girl who commits suicide, four men kill themselves. The issue presented is that men refuse to seek treatment, tell themselves that they are fine, and have been raised since around the age of ten to hide their emotions. Speak to some guys you associate with; many, if not all of them will say they have not cried since their youth, since crying is a bad image for their masculinity. Step into the shoes of a depressed male: On your worst days, it could take you even an hour to get out of bed. You lose all motivation to do anything, even those activities which used to please you dearly during your 'better times.' 'The little things' do in fact get to you now. When depression hits, you often become oblivious to the fact that you know people still care about you, but it seems like not a soul cares at all, like you are developing psychological tunnel vision and viewing life through tinted lenses. You are not necessarily suicidal, but ideas like jaywalking without looking because you don't care if you get hit by a car, being cruel to people around you in hopes that they leave you and you have less reason to live, drinking in hopes that your liver fails, or any similar thoughts come across your mind occasionally. You feel shut out since you cannot express emotions without being judged. Blankets of emptiness, numbness, nothingness, hatred, and worthlessness shroud you and deplete your efforts to socialize. In the words of comedian Kevin Breel, "Depression isn't when you feel down when everything is going wrong, rather depression is when you feel down even when everything is going right." What to do now? Some traits you can pick off about a depressed individual are loss of appetite, lack of motivation, tendency to prefer long sleeves, concentration issues, and eerie sleep habits among others that are a Google search away. Regardless of your gender and what you may believe, I encourage you to take Goldberg's Test and give honest responses. It may not be a professional, but if your score and responses raise woes, then seeing an actual psychologist or psychiatrist is ideal. Many people are too broken to speak to a professional, so there is indeed a legitimate crisis text line which will hook you up with a professional if you text GO to 742-742. Spread the word, because you may never know who is suffering, let it be a family member, friend, or even a stranger, and how sharing this information could save a life. Every life matters.